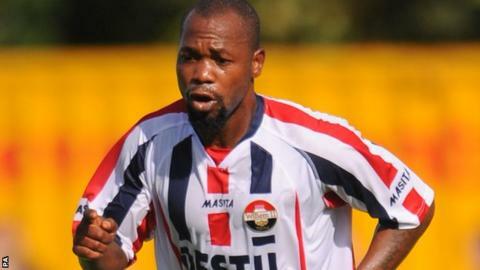 Welling United have signed former Sierra Leone captain Ibrahim Kargbo, who is banned from playing in the Netherlands over match-fixing claims. Dutch football's governing body, KNVB, alleges he was involved in trying to fix a benefit game in 2009, a claim he denied earlier this month. Midfielder Kargbo last played for Isthmian League club Thamesmead Town. The 33-year-old will be in Welling's squad for Saturday's National League game against Aldershot Town. No details of his agreement with the club have been disclosed. He has 34 international caps and has also had spells with clubs in Belgium, the Netherlands, Azerbaijan and Portugal during his career. Kargbo was among 15 players and officials suspended by the Sierra Leone Football Association in 2014 over match-fixing allegations. At the time, he said he was the victim of a "witch-hunt" and all the bans were lifted by Sierra Leone's Ministry of Sport in March last year. Recently interviewed by BBC Sport about the KNVB accusations, which relate to a game between Sierra Leone and Dutch club Willem II, he said: "It is unbelievable that I can be accused of match-fixing. "These allegations have caused me a lot of stress, sleepless nights and I have sometimes cried all day - all because of something I know nothing about. I have nothing to hide."